On Thursday, March 29th, Linden Lab announced the official launch of Second Life Places, making the programme available to land holders in-world. First announced in a beta programme in January 2017 (see here for more), Places essentially allows region and parcel owners to create a web browsable page (hosted by the Lab) for their location(s) in-world. These pages can then be shared through blogs, websites, etc. Included with each page are buttons to allow visitors to the page to launch their viewer and teleport directly to the location (assuming they are Second Life users – if not, they’ll have to sign-up via the provided link to the main sign-up process). About Land > Show Place in Search must be checked (recurring fee of L$30 a week). 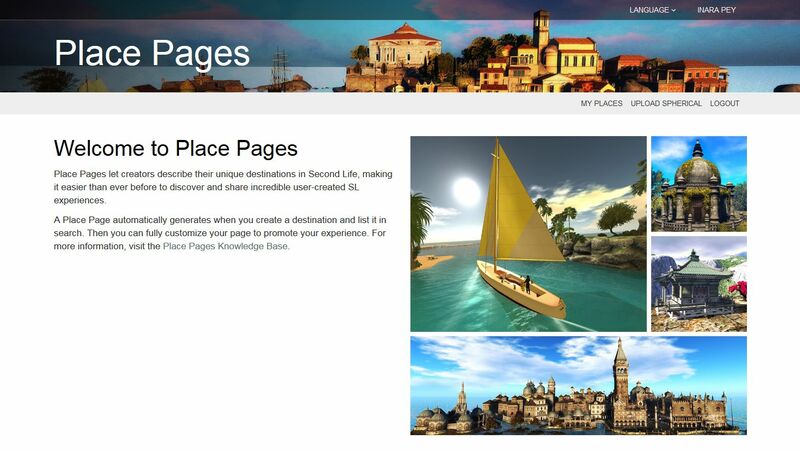 Home page for Second life Places – you’ll need to go here to get started. Places Knowledge Base article – where the meat and bones information resides. Note you may have to log-in to Places when you open the page. Options on the page are controlled via a menu towards the top right corner, which can be seen when you are logged-in ( highlighted in red, below) – providing you have land which meets the requirements to have one or more Places pages. Logout – logs you out of Places. I’ve not had a chance to drive things in detail, but one minor issue I noted was that this listing appears to list Holly Kai Park as Adult, when it is in fact Moderate – which is correctly reporting in the actual page for the region. The Edit option opens a basic page layout for a Place to which you can add details – text, images, video, etc. Again, see the Knowledge Base article for more details. The 360-snapshot viewer is currently only a project viewer, and is awaiting significant update. You can find it on the Second Life Alternate Viewers listing page. I have an overview of the 360-degree snapshot viewer available, but please note that it refers to the initial release (the release prior to the one available at the time of writing this article), and functionality in the viewer may have changed. I’ve also not had an opportunity to test the Upload Spherical capability with the current 360-snapshot project viewer, and so offer no guarantee the capability works. I’ll have a more in-depth look at Places and setting them up in due course, hopefully including the updated 360-snapshot viewer, once it is available. This is exciting news. Region owners like me have been waiting for this as another tool to promote what is available.